Electabuzz is a slightly humanoid creature with a few feline traits. It is covered in yellow fur with black stripes; a large stripe on its chest is shaped like a lightning bolt. It has a long tail. There are three, clawed toes on its feet; two in front and one in back, while it has five fingers on each hand. 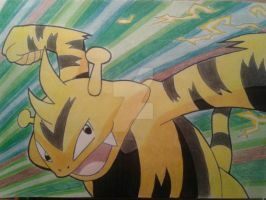 Electabuzz has two sharp fangs and a pair of antennae with bulbous ends. In the dark, Electabuzz will glow a light blue with the electrical charge stored inside of it. AWWWWWWWW YISSSSSSSSSSSS, my man ELECTABUZZ! !